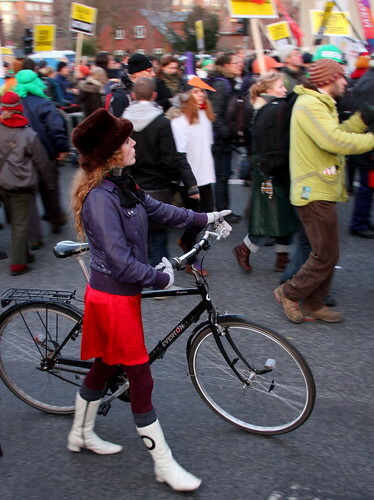 Hot off the presses - or rather the memory card - are these Climate Demonstration Cycle Chic shots. Earlier today Felix and I rolled out to what was expected to be a highlight of the current climate conference here in Copenhagen. A massive demonstration that walked from the parliament to the conference centre. 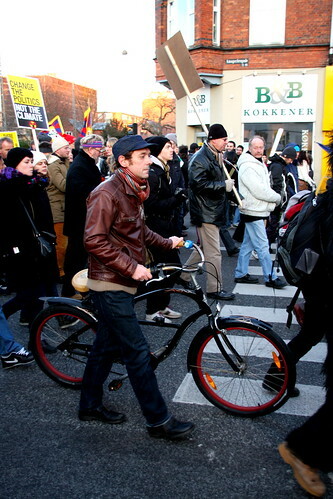 The photo, above, is the demonstration's finest, chic'est Copenhagen avec bicyclette. It's worth mentioning that the temperature was just above freezing. 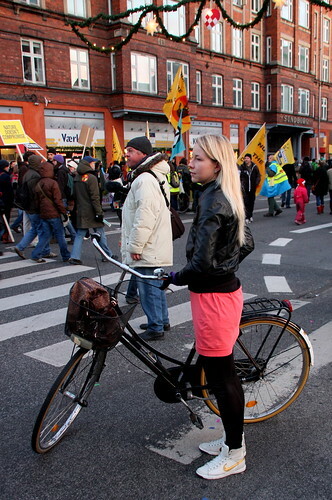 Here's another excellent cycle chic Copenhagener. The news here in Copenhagen is reporting that 100,000 people took part and it really was a brilliant demonstration. It was amazingly global with different languages spoken all around you. Many people stood along the roads and watched. Felix and I walked with the crowds for a while and then pulled over to just stare in awe at the masses of peaceful demonstrators. It was great that he could see this. 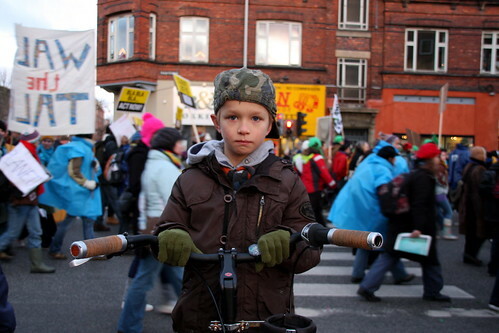 You have to go back decades to find a demonstration of this size in Copenhagen. The number of bicycles was amazing, too. Families with cargo bikes, citizens of all ages walking their bikes, you name it. This chap is the clear winner of the Cycle Chic pour hommes award today. Here's Felix standing in the cargo bay of our Bullitt cargo bike, from where he watched the world - literally - go by. So happy to see a good turnout. I wish more children were taken to things like this. If they see people standing up for what they believe in then they will grow up to do the same. Have loved this blog for years. Been biking since college days. Classmates, professors, and students have been making fun of me biking in skirts, dresses, and high heels. And, well, not wearing a helmet. Well, Manila isn't exactly one of the safest cities in not exactly one of the safest countries. Glad to see an entire city of kindred souls. Environmentalism, style, and cost-free transpo --- more people should embrace those. Wow! He's grown a lot since I've started following this blog!!! I actually realise that seing your kids grow (and being born, some of them:)) is an excellent time tracker on cycle chic. Thanks for sharing their photos! Thanks for the photos. Demonstrators seem to be demonized in the States regardless of the issue. They are just looked upon as radicals and their cause marginalized as fringe. Are the demonstrators viewed with similar distain in Europe? "Demonstrators seem to be demonized in the States . . ."
Not that being someone who could afford to own an "inexpensive" $20k car but opted for a "ridiculously expensive" $2K bike instead hasn't put me there already. Go figure.